Jack Groppo, researcher at the UK Center for Applied Energy Research, is working with university and industry partners to retrieve valuable chemicals known as "rare earth elements" from fly ash, the residual material left over after burning coal. Scientific breakthroughs throughout history have arisen from a combination of fierce determination and a desire to improve lives. Breakthroughs at the University of Kentucky have been no different. Our past and present achievements underscore that the biggest discoveries – the ideas that change how we work or transform the health of communities – happen because someone was unwilling to stop. They kept asking questions and seeking solutions. Consider the fact that the earliest technology behind modern touch-screen systems was pioneered by former UK faculty member Samuel Hurst in the 1960s. The innovation, which would later transform entire industries, surfaced from his unrelenting efforts, paired with his desire to make information more accessible to the public. Likewise, Margaret Ingels, UK’s first female engineering graduate, conducted extensive research on heating and ventilation throughout the 1920s. Through these tenacious efforts to enhance human comfort, she helped lay the foundation for modern-day air-conditioning technology. In both cases, researchers answered, in profound and compelling ways, two simple questions: What can we learn? How can we use this knowledge to better society? Today, researchers at UK are addressing these questions in a variety of domains, from opioids to cancer, energy and beyond. UK researchers also are seeking answers to some of the most important health questions in what may seem like an unlikely place: the genetic code of nearly extinct salamanders located only in a lake outside Mexico City. UK scientists are examining the regenerative capability of axolotl salamanders, a rare animal which can regrow its limbs, tail, spinal cord, eyes and, in some species, even half its brain. If scientists could unlock the secrets that endow axolotls with this remarkable ability, the knowledge could have lasting significance. It could open doors to a new era of biomedical breakthroughs—new pathways for tissue regeneration in humans, with implications for spinal cord injury, stroke, joint repair and more. UK hosts the only federally-funded axolotl stock center in the country, providing axolotls to researchers and educators worldwide. This is crucial, as biomedical research is becoming increasingly driven by genetics. UK researchers are on the forefront of the field, having adapted a traditional approach to map the axolotl genome quickly and efficiently. Mapping this genome was no easy task; it is 10 times larger than the human genome. However, as humans share many of the same genes with axolotls, the complete genome sequence greatly increases its value for biomedical discovery. Our efforts in energy research represent another unlikely domain with implications that reverberate through Kentucky and beyond. Researchers at the UK Center for Applied Energy Research (CAER), are locating and evaluating rare earth elements (REEs) found in coal and coal byproducts. What can we learn from these, and what might they mean for society? REEs are a series of 17 elements within the Earth's crust, and because of their unique chemical properties, they are essential components of technologies spanning a range of applications, including smartphones, batteries and defense technologies. They also are used in renewable energy technologies, like wind turbines and solar panels. 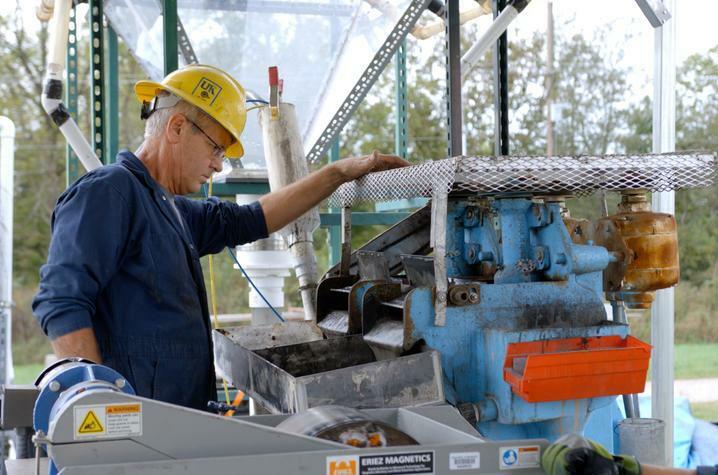 With funding from the U.S. Department of Energy, U.S. Department of Defense and National Science Foundation, UK’s team at CAER is working with university and industry partners to retrieve these valuable chemicals from fly ash, the residual material left over after burning coal. China currently produces the majority of the world's REE supply. Scientists and policymakers agree that our country needs to find a domestic source, and the premier domestic source is likely the Fire Clay coal seam in Eastern Kentucky. This gives Kentucky and UK a greater opportunity to lead in this promising area. These are just two examples of UK researchers opening doors to new realms of discovery—new intersections of knowledge that can move from the laboratory into industries and communities. They are testaments to UK’s distinctive position as a land-grant, flagship, premier research institution. UK has a nexus of talent and infrastructure – the people and high-tech spaces where collaboration yields discoveries that save lives, heal communities and create jobs. For more than 150 years, we have been deeply committed to Kentucky and the world beyond its borders. It is the root of our historic land-grant mission and far-reaching vision for our flagship responsibilities. They are accounts of fierce resolve and unwavering compassion—of individuals determined to find answers in the spirit of uplifting lives. They reflect that what happens here can change a state and a world. That is our role as Kentucky’s university. It is how we show the world what Kentucky can do.